Writing a teaching philosophy statement in conjunction with a resume and application letter will allow you to communicate your authenticity. The enormous benefit of writing a teaching philosophy statement and submitting this job search document is still unknown to many educators. Use it to your job search advantage. 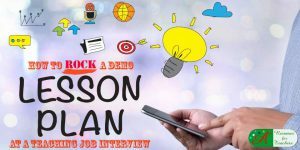 The philosophy statement is growing in popularity and known as an added job search marketing document in the education sector. 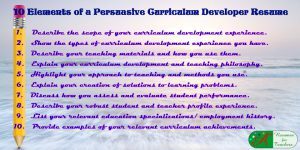 When you organize your teaching portfolio the statement is a vital component. Get an understanding of what to include in a teaching philosophy statement by review this example. Creating a quality, creative teaching philosophy of education can be difficult; getting started can be the hardest. My first piece of advice for writing this important document is to ensure it reflects who you are as an individual. Let your personality and passion for teaching and learning shine. 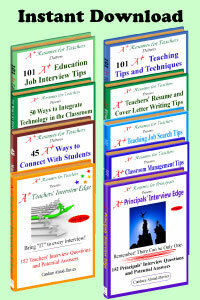 An educational philosophy will help you to secure your first teaching job, a new position, tenure, or promotion. Write it clear, concise, and true to who you are as an educator. 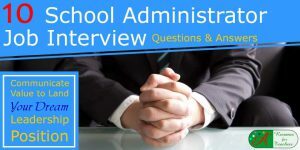 A well-written philosophy of education statement can set you apart from the competition and give you the earned advantage you need to receive a call after a teaching interview or secure a job offer. There are many types of philosophy statements including one related to educational digital leadership. 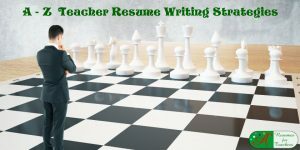 If possible submit the statement with your teacher resume and application letter. If you can’t include with your online application, bring it to the job interview. Usually, a philosophy of teaching statement is one to one and a half pages, double-spaced, and illustrates an educator’s beliefs about education, learning, and working with students. The narrative covers numerous different issues, and, therefore, must be very concise because you don’t want to ramble on for more than two pages. 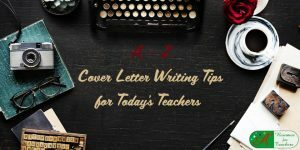 The writing of the statement can vary, but most use a straightforward, narrative essay approach. More creative educators may use a poem format. Others may pose questions and then their responses. Communicating your values and beliefs of teaching in your philosophy of education statement to show passion. What style of instruction you use and why you feel it is effective? How do you wish to be remembered by your students? Why do you believe teaching is a valuable career? What do you to help your students learn and develop as individuals? Was there a person who influenced your life and your career as a teacher, such as a mentor, a theorist, a researcher, or an author. How do you think learning occurs? What obstacles do students face and how you can help them to overcome these difficulties? What is your personal characteristics and approach to teaching and how do they impact the learning and development of your students? The writing of the statement must be reflective, personal, and exceptionally concise. You will be judged on grammar, spelling, and sentence structure, as well as on your thoughts about teaching. 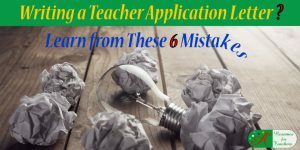 It is critical to have a well-organized, thoughtful, and error-free document, which gives a vivid picture of you as an educator. Using examples or metaphors may help when you are writing a teaching philosophy statement. 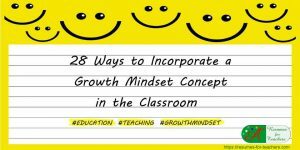 Realize your statement will change over time to correspond to your developing and changing beliefs, values, views, and approach to teaching. 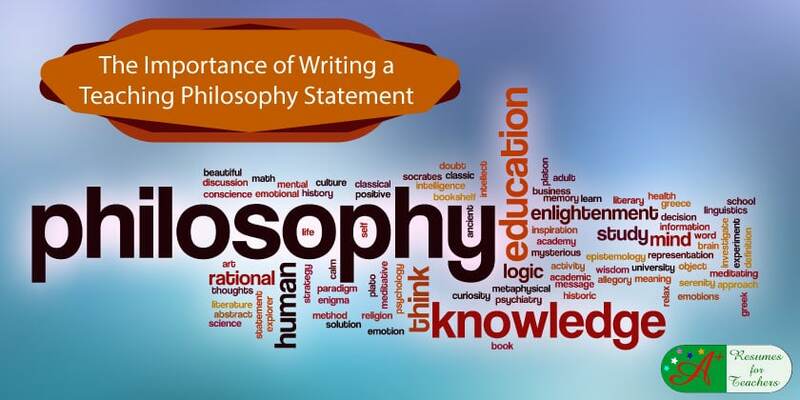 Writing a teaching philosophy statement will help you as an educator grow professionally. For example, it will assist in defining classroom goals, increases emotional investment in their career and enhances awareness. It is a highly thought-provoking exercise, and you must be able to articulate clearly your goals and vision, as well as your road map to achievement. 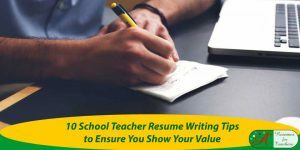 Candace Alstad – Davies, owner of A+ Resumes for Teachers is always around to help with your job search documents and interview preparation. 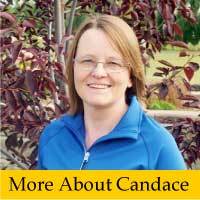 Check out Candace’s bio! Previous post: What Subject Do You Most Like to Teach and Why?